If you're running a Mac and haven't upgraded to Photoshop CS4 yet, then I have good news for you. You can get the latest version of Adobe Camera Raw (5.5) with all the current profiles, and the CS4 version of Bridge, with the just-announced Photoshop Elements 8 for the Mac, and you can get it for $79. 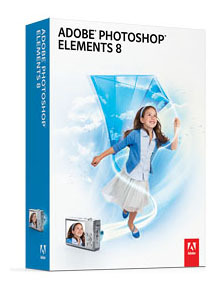 (According to the official press release, "Adobe Photoshop Elements 8 for Mac will be available in Oct. 2009." You can have Adobe notify you when it's available.) As part of the deal, you get Adobe's latest merge technologies included the new Photomerge Exposure. One of the reasons I think this is exciting is because the Bridge CS4/ACR workflow is so powerful. If you really look at what's there, you only need Photoshop or Photoshop Elements for the finishing touches on your best photos. I wrote an entire book on this approach. You can hear all about it in my interview with Bob Gager podcast. Bob is the Elements product manager for Adobe. Get the most out of Adobe Camera Raw 5.5 and Bridge CS4. 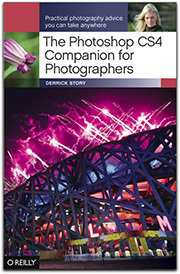 The Photoshop CS4 Companion for Photographers lays out the entire workflow that you can master in just a day. It fits in your laptop bag and is very easy on your wallet. And it works with Photoshop Elements 8 for the Mac too! Given the workflow that you present in you Companion book, is there a real advantage for getting Photoshop CS4 over Elements 8? Are some aspects that you discuss absent from Elements? Is one program substantially better than the other when it comes to printing? I was suppose to get a $20 rebate and it was suppose to show on my order but didn't. I have been charged 94.49 Please help.